Cast Member Magic ~ Cinderella's Step Sisters Are Pretty Awesome! Read Why Below! Cast Member Magic ~ Cinderella’s Step Sisters are Pretty Awesome! Read why below! It’s Thursday, and if you’re a regular reader, then you know each week we talk about acts of kindness or we talk about a magical experience at Disney. Cast Members are great, as you know, but this past week we had a special experience that I wanted to share with you all! This time, we’re recognizing “villains” instead of the usual Disney heros! Drizella and Anastasia, Cinderella’s “evil” step sisters. But are they really the bad guys? I’d say no! Let me give a little bit of a back story. My boys are seasoned Disney vets. We go to the Parks all the time. Granted, we don’t do many Character meals, but we’re always around somewhere. On Mother’s Day, we went to 1900 Park Fare for dinner, where they had the Cinderella themed characters in attendance ~ Cinderella, Prince Charming, Lady Tremaine and the step sisters, Drizella and Anastasia. My boys are a little more shy with face characters, they never know what to expect. My older son Andrew, doesn’t get as excited as he used to about the characters. He’s getting older now, and it’s hit or miss on how he’s going to react when he interacts with them. Well, on Sunday, he got a surprise, and so did I with his reaction. When we got seated, we were waiting for our server to come over and greet us, and there were no characters in sight. I was getting settled in, and I looked up and Andrew was laughing because Drizella was walking by, and came right over to him and started playing with his hair. It wasn’t our turn for a character to come by, we didn’t even have water yet, but she spotted Andrew and walked over to him. I was startled at first, because he’s usually a little shy and I didn’t know what he was going to do. She messed up his hair, played with it for what seemed like forever, it was hilarious. Then, Drizella asks him, “What’s your name handsome?” He shyly says “Andrew” then looks back down. Then, she says “How about if I just call you Dreamboat, Andrew?” “I think we’re going to get married, ok?” We were just dying. Drizella insisted that Andrew get up for an engagement photo, messy hair and all, see below! I thought Andrew would be embarrassed, but to my surprise, he actually LOVED every minute of it. The attention she gave him made his day. We went back about our business, the server came, and we started our dinner. The characters took awhile to get to us, but once they did, we saw them one after the other. The Prince came over first, then Cinderella. When Lady Tremaine came over, the fun ramped back up again. She came to the table, and my younger son told her that Andrew was asked to marry her daughter. She asked him what grade he was in, and he told her the 8th grade. Then Lady Tremaine told him “Well Andrew, today 8th grade hearts are breaking every where, because we have you now and you’re going to marry my Drizella.” She really played the part of the “mother in law” well. She welcomed him to the family and had him get up for a picture. It was hilarious. Again, he loved it. Yes, my shy boy was coming out of his shell and having a great time! At this point, I seriously thought things couldn’t get any better. I was so wrong. Next, the other sister, Anastasia showed up. What’s the first thing she did? Played with Andrew’s hair! The smile on his face in the photo below says it all. Disney magic, yet again. Anastasia asked Andrew if he was available, and again, Aidan spoke up and said “Your sister was already here earlier and asked Andrew to marry her.” Well, this set her off. Out of the blue, Anastasia starts yelling at Drizella a few tables down, and they started fighting over Andrew loudly, his face was so red. It was great. She was hugging on him, and yes, he loved it. Even Aidan got a big old hug. Drizella yells “HEY” in a high pitched voice… “I saw my sister over here, what were you doing, I thought we were getting married?” Poor Andrew, the look on his face was priceless. After a few minutes of harassment from her, she smiles and says “Ok, I forgive you, get up and give me a hug!” And you guessed it, he did indeed get back up….. and yes, loved it. Drizella told Aidan that since she was going to be his new sister-in-law, that he gets a hug too. Yes, the dinner at 1900 Park Fare was supposed to be a treat for me for Mother’s Day, but it turned out to be Andrew’s shining moment. That, in turn, made my evening even better. When your kids are growing up, and going through different stages, we don’t always know what’s going to make them happy or what will bring them out of their shell. Andrew is 13, almost 14, and it’s a touchy age. He’s a good kid, still very young at heart, but has a hard time sometimes stepping out of his comfort zone. Usually it’s my 10 year old who is all about the characters, but thanks to some special Sisters, they helped my older one warm up and just enjoy. 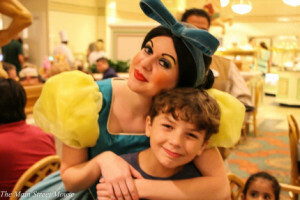 5 Responses to Cast Member Magic ~ Cinderella’s Step Sisters are Pretty Awesome! Read why below! This brought tears to my eyes! This is why I love Disney!! We are going there for my daughter’s 5th birthday! I can’t wait!!! My last trip to the World was my first time to go to 190 Park Fare. that team with out a doubt is the best ensemble group in interacting with guests. As you have told us they can keep up the shenanigans with one guest or ten all evening long. One of the few groups I have gone out of my way (Back to MK-GS) to write them up. I also forgot my personal thank you cards that day. Just one more reason to love Disney. How do i get something submitted to Cast Member Magic?